Before setting off to claim a million-dollar bounty offered by MLB 2K11, Brian Kingrey did an analysis. He pored over batting averages, compared pitcher strengths and tendencies, examined the probable starters for the contest's opening day and the batting orders they faced, to determine what hurler had the best chance of tossing a perfect game. Big-time baseball fan, huh Brian? "No," said the 25-year-old music teacher from Hammond, La. "This is the first Major League Baseball video game I ever played in my life." 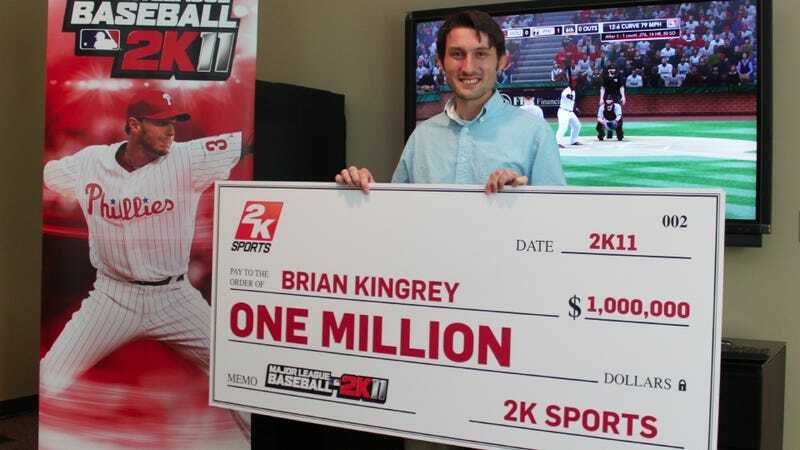 Kingrey won a million bucks from 2K Sports thanks not to an innate knowledge of baseball or those who play it, but simply being very good at video games in general. A bigger fan of shooters and RTSes, Kingrey threw the first verified perfect game in MLB 2K11 the old fashioned-gamer's way: By playing the game until he mastered it. "I went to the local GameStop about two weeks before the contest began, went home and just started grinding," says the League of Legends buff. Kingrey, in fact, had to be talked into going for the perfect game by his wife, Karyn. The young couple were watching X-Play on G4TV one evening when the show mentioned the perfect-game contest, the second one held by 2K Sports. Karyn had watched her husband play video games expertly and wondered why this one should be any harder. "One of the reasons I married her is she's OK with me playing video games," Brian said. "She'd fall asleep in the chair as I was playing and practicing [MLB 2K11]"
Brian had to study up not just on the performers in the game, but also on some of the rules of baseball. The contest opened on April 1, about a month after the game's release and two weeks after Karyn told Brian to go pick it up. In that span, he pitched with every team's opening day starter to get a feel for their repertoire. The game required contestants to use one of the real-life lineups of the day they were playing, a feature served by MLB 2K11's MLB Today mode. Brian quickly settled on the Philadelphia Phillies' Roy Halladay, also the game's cover star, for a couple of reasons. The first is that his April 1 opponent would be the Houston Astros, one of the poorest hitting teams in the game. The second is Halladay's cut fastball, a blowtorch that runs hard away from righthanded batters. Houston had only two lefthanded batters in its projected starting lineup. The rest of the Astro hitters, Brian noted, were all very aggressive, making them more likely to chase pitches outside the strike zone. It all added up to 27 consecutive outs, a perfect game, which Brian threw just two hours after the contest's official start time. "I took a day off for it," Brian said. He teaches piano, guitar, band and choir at the high school where he lives. "I figured if I didn't then some young kid would probably get to it first." 2K Sports had said this year it would award the prize as soon as it confirmed a perfect game had been thrown according to a very strict set of rules, verified by Twin Galaxies, the international high score certification authority. Nearly two months had passed from the contest's opening to the announcement last week that they'd found a winner, and in that span a few videos had hit YouTube purporting to show successful perfect games. Evidently all of them either came later than Brian's, or were disqualified for other reasons not shown in the video. Asked why it took so long to verify a winner, 2K Sports released this statement: "A million dollars is a lot of money. And when you have that kind of money on the line, it's important to make absolutely certain the submissions are correctly judged and verified. We take the process very seriously and getting it right was our number one goal." The million bucks going in Brian and Karyn's bank account is a handsome sum but it won't be life-changing, if the couple's wish list is any guide. Their first purchase: A refrigerator. "Let's say it's like a dorm fridge," Karyn said. "It's really about half the size of a dorm fridge. It has two shelves and something you might call a freezer." After they get a proper fridge, the next plan is to give their car, a Toyota Corolla, to a friend who needs one, and replace it with a Nissan Leaf. "All electric, man," said Brian. Right now, the couple is enjoying a stay in 2K Sports' New York digs - the "Fan Cave," where they met last year's winner, Wade McGilberry. Brian and Wade faced off in MLB 2K11 and swapped Gamertags. McGilberrry and his wife used their winnings to pay off their house and start a family. In addition to sensible purchasing habits and a self-deprecating nature, the two also hail from Gulf Coast states. McGilberry is from Semmes, Ala.
Is there something about that region that makes people better video gamers? "I don't want to say anything about the rest of the country, but we have a little more smarts down here than we get credit for," Wade said. "Birmingham, Huntsville, we have all the NASA scientists, you know."